As an American working at the World Expo, the aspect of the international event that surprised me the most was not the gigantic sphere plopped right in the middle of the Expo grounds, nor was it the futuristic looking buildings that surround it. Of all the bizarre and interesting things that have transpired during my time at the World Expo, pin trading definitely takes the cake: seemingly ordinary pins that you collect, trade and attach to your Expo lanyard, hat or shirt. The first day of work I was awarded a handful of USA pins – one spherical pin with the United States Pavilion logo, and one that pictured the Kazakh and American flags as hands, shaking harmoniously. I was told to be extra cautious with how I use these pins and to trade them to get different, better ones. It seemed trivial at first, but that was because I did not understand the strong desire Expo-goers had for trading them. 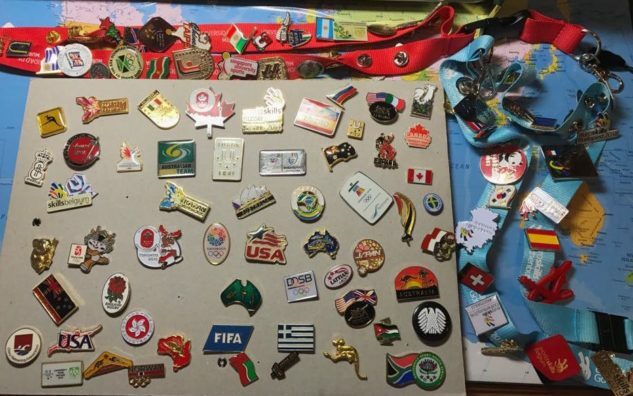 Initially, most other pavilions would hand out pins – some far more than others. The power of the pin was not apparent to me until a couple weeks into the Expo, when they started to become more difficult to obtain. Working in my pavilion’s queue, people began to come up to me and kindly inquire about whether there were any pins left – when they found out that the US pins were only available by trade, they began to push and beg for them. Policemen, doctors, and government workers would come up to me and grab my lanyard in hopes of finding one they would like; even in restrooms, random people would see my collection and ask when I would trade or gift them a pin. People who would otherwise seem completely disinterested in the idea of this would end up showcasing pins from three Expos ago in hopes of trading for new ones. That is when I knew I needed to start hiding my lanyard. Not all pins are created equally, however: on everyone’s lanyard was seen the notorious Thailand corn pin, which significantly decreased its value to other Expo goers. Countries that have rarer pins, usually only awarded by trade, were sought after and even obsessed over. On a similar vein, they also do not universally hold a similar store of value for everyone: certain pins can be incredibly valuable due to the personal connection someone establishes with what it represents, regardless of its rarity. Most of the time, however, the appearance, country of origin, and even the size of the pin determines its worth. For example, smaller and more compact pins hold significantly more value than large button pin. Although this “Expo currency” may not be a traditional currency, certain pins can take you far. From personal and observed experience, I have seen them traded for lunches, money, and heaps of other stuff; some cafeteria workers will even give free food in exchange for certain pins. I am amazed that this tradition has continued on from past Expos, and I am excited to see how it will play out in future ones. I am excited to see how far my earned bounty in Astana will take me in future Expos, and what pins will be showcased in the years to come! This post reflects the opinion of the author and not the USA Pavilion and its sponsors.